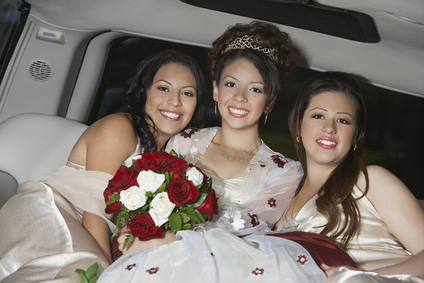 It’s a magical day you’ve long been planning, and she’s been dreaming of—complete your daughter’s fairytale quinceanera by booking one of our enchanting stretch limousines, and we’ll ensure the party’s safe transport in elegant luxury. Imagine her surprise when our 14-passenger super stretch limousine pulls up in the drive, primed and ready to elevate your party of friends and family into a wondrous world of elegant paradise—with plush leather seating, multiple LCD monitors and state-of-the art sound system. On your daughter’s thrilling day—full of makeup and hair appointments , and excited chatter with friends and family—our professional drivers will be there to offer their services at every turn. We’ll usher you from home to the salon, church, party venue and wherever else the charmed night may take you. Our skilled drivers navigate the Vegas streets safely and smoothly, so the only thing you’ll need to worry about is cherishing this once in a lifetime moment as you watch your little girl savoring her grand coming of age party. Remind your daughter just how special she is, and make her quince one of the most memorable and glamorous nights of her life (and yours). We at LV Limos will be delighted to help you and your family celebrate this special moment in your daughter’s life, and we will be there, ready to provide immaculate service for you and yours through whatever joyous occasions life brings—be they proms, homecomings, graduations, or weddings. No matter the occasion, you can always trust LV Limos to provide breathtakingly exquisite rides and unparalleled service at the hands of our impeccable and accommodating drivers. But for now, sit back and enjoy this moment with your family as you celebrate your daughter’s achievements and eagerly look forward to her bright future. Remind your daughter just how special she is, and make her quince even more memorable and glamorous. Treat your daughter like the princess she is. Dial 702-761-3338 and cross transportation off your checklist!